This is my final post in my series on Cascade Platinum. I have continued to enjoy testing out the product in my dishwasher. This past week, I put in a casserole dish that had contained homemade baked macaroni and cheese, and was pleasantly surprised when it came out clean and sparkling. My dishwasher is so clean after running a load of dishes, thanks to the special triple action recipe in each Platinum Pac. This week, Cascade has a "My Platinum Clink" contest - just upload an image of your favorite drinks served in shining glasses to Instagram to enter. You could win a new dishwasher or even a Platinum kitchen makeover! My glasses have looked incredibly clean and shiny since I started using Cascade Platinum, so I had fun making a few special drinks. First, I treated the twins to a root beer float. They had never had one before, and were delighted. It was the perfect summer treat. And then then I made a adult version special drink treat - mimosas. I don't drink often, but I do love a mimosa on a special occasion. I have to admit - my wineglasses have never looked better! I will continue to use Cascade Platinum in my dishwasher, as it truly has performed up to expectations. Readers, I hope you'll give it a try in your own dishwasher, if you have one! Do you have a favorite drink for special occasions? I'm glad you have posted about Cascade platinum. Etching is such a problem with my glassware and the inside of my dishwasher is dull and dingy looking. I found a coupon in the paper for this product and plan to buy some today and give it a try. What fun! I love root beer floats too. I had forgotten about Type A! It was so much fun! It sure sounds like a great product. I'm going to check it out. I'm a mimosa gal too. My friend makes them the best so I always drink them at their pool parties in the summertime. I should learn to make them too.. can't be too hard. I bought a small bag of Platinum packets. It seems to perform better than the cheap stuff I have used for years. Not sure it performs well enough to justify the cost, but maybe... Glasses are looking less hazy, and the inside of the DW does look cleaner though. Love the photo of the kids sharing the float--they look so serious about it! 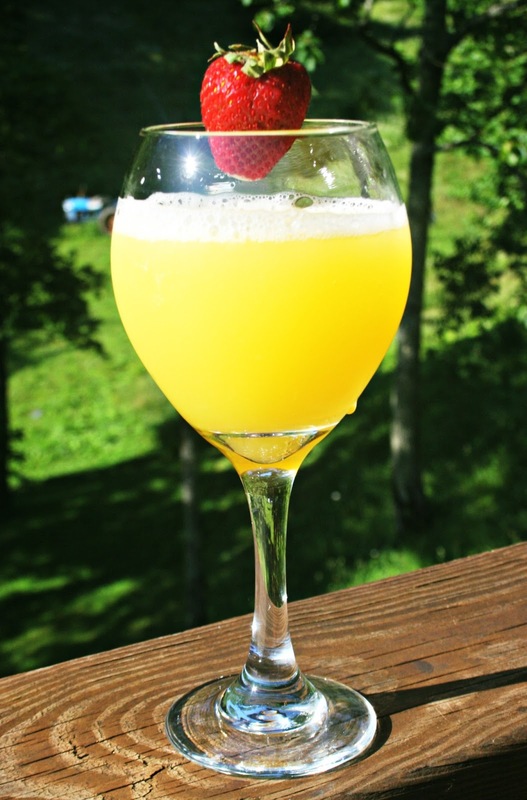 That mimosa looks so refreshing. For special occasions, I love Kahlua and creme. 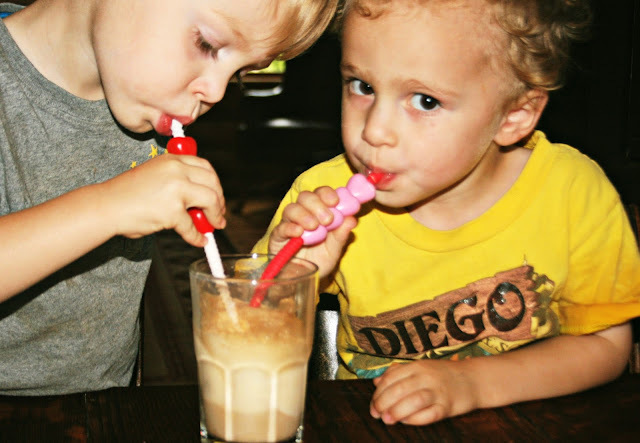 When my son was much younger her loved root beer floats! That drink looks so good! I should check the recipe.. and the kids seem to enjoy it so much! How is the horsey? it does make the dishwasher clean too. Nice perk! I haven't had a rootbeer float in years either. How fun for the boys!